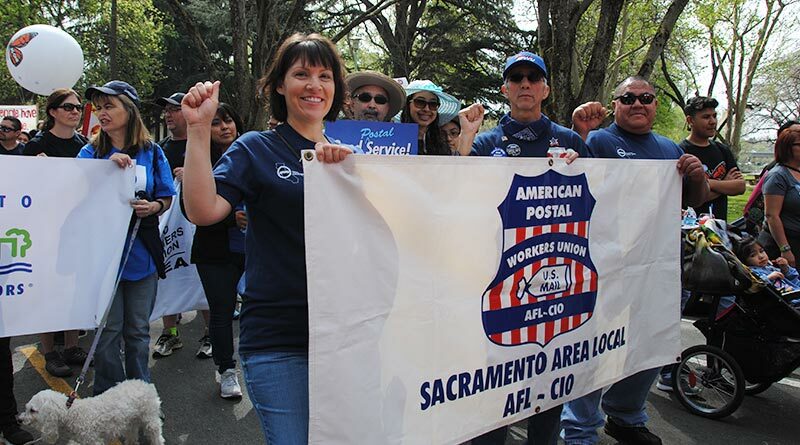 Members of the American Postal Workers Union in Sacramento marched in the 18th annual Cesar Chavez Day parade. Hundreds of union members and allies came together on March 31 for the 18th Annual Cesar Chavez March and Rally. 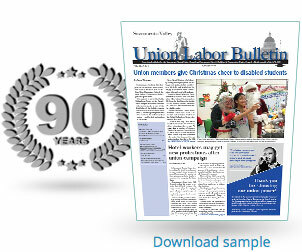 The event was organized by the Labor Council for Latin American Advancement, Sacramento AFL- CIO (LCLAA). It began at Southside Park, where speakers gathered to talk about community, family and the many issues currently facing working people in Sacramento. Those issues included fair wages, access to housing and police use of force – including the shooting death of Stephon Clark by city police. Dean Murakami, Vice President of the Sacramento Central Labor Council and President of the Los Rios College Federation of Teachers, was one of the speakers. California Community Colleges make up the largest system of higher education in the world, said Murakami. He pointed out that the system has helped countless Californians achieve their dreams. He also spoke about gun control. Yvonne Walker, president of SEIU 1000, also spoke. Walker said there is a storm in California around issues including affordable housing and retirement with dignity, but working families are their own “storm’ with the power to effect change. She highlighted how working-class members, including state workers, are being forced onto the street because of skyrocketing rents in Sacramento. Walker also spoke about Black Lives Matter and the shooting of Stephon Clark. “We have to prepare for the battle ahead,” Walker said. “We as warriors know that the storm is our power… we are prepared to take to the streets if necessary to make a California we can all be proud of … We are the storm that will resist every effort to divide us,” she said. Earlier in the month, hundreds of union members also turned out for the March For Our Lives, a rally for gun control in the wake of the Parkland school shooting in Florida. Union members also gathered early in the month to protest a visit by U.S. Attorney General Jeff Sessions in downtown Sacramento. Sessions spoke to a gathering of law enforcement professionals, describing California’s sanctuary policies for immigrants as dangerous and potentially illegal. While Sessions spoke, hundreds marched outside his downtown venue, including local and state politicians.